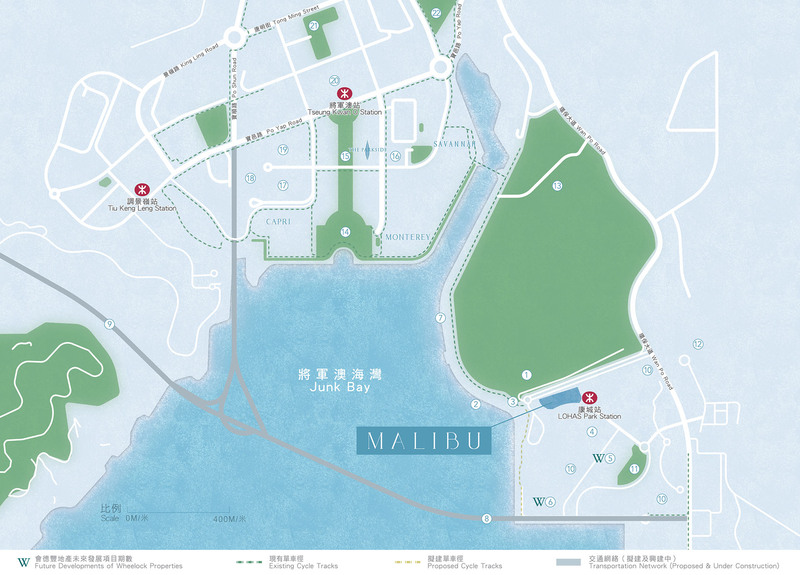 To the extent this website www.malibu.com.hk constitutes an advertisement, this notice shall apply. MTR Corporation Limited, Leading Elite Limited and other parties own the trade marks, trade names and logos displayed on this website. These may not be used without written consent of MTR Corporation Limited, Leading Elite Limited or the parties owning them. All information and materials on this website are protected by copyright. No part of such information or materials may be modified, reproduced, stored, transmitted, copied, distributed or used in any way for commercial or public purposes without prior written consent of MTR Corporation Limited and Leading Elite Limited. The names of the above clubhouse facilities under the approved plans of the Phase of the Development are as follows: The Pitch=Ball Court；Rhythm Room =Music Room；The Deck=Landscaped Deck； The Theatre=Video Room；Body Studio 24=Gymnasium；Soul Studio=Yoga Room；Kid’s Lounge =Children Library；The Playground =Children Play Room；Getaway=Function Room 1；Escape=Function Room 2；Retreat=Function Room 3；The Lounge=Lounge；Infinity Pool =Outdoor Swimming Pool；Splash=Kid’s Play Pool；The Pool=Indoor Swimming Pool；The names of the clubhouse's areas and facilities are for promotional purpose only and shall not be displayed in any deed of mutual covenants, provisional sale and purchase agreements, formal sale and purchase agreements, assignments or other title deeds. The information in this advertisement is not indicative of the final appearance of the clubhouse and recreational facilities for the Phase of the Development upon completion and is for reference only. It does not constitute or shall not be construed as a reference to any actual design, layout, space, building, position, fittings, finishes, appliances, furniture, decorative materials, plants, landscaping and other objects of the clubhouse and recreational facilities, or their vicinities, facilities or buildings, whether express or implied, as an offer, undertaking, representation or warranty. The colors, materials, fittings, finishes, appliances, decorations, plants, landscaping and other objects of the clubhouse and gardens are not standard provisions and may not necessarily be provided or appear in the Phase of the Development or any part thereof upon completion. The vendor reserves the right to make modifications and changes to the clubhouse facilities and the gardens and any part thereof without notice to purchasers. Purchasers shall not rely on this advertisement for any purposes. Purchasers are advised to refer to the sales brochure for any information on the Phase of the Development. The facilities and completion date of the clubhouse, gardens and/or recreational facilities will be subject to the final approval of Buildings Department, Lands Department and/or other relevant government departments. Clubhouse, gardens and/or recreational facilities in the Phase of the Development may not be immediately available for use upon the delivery of vacant possession of the units. The use or operation of some facilities and/or services may be subject to the clubhouse rules and the consent or permit issued by relevant government department. Clubhouse and/or recreational facilities may be subject to charges. Saleable Area: 368 Sq. Ft.
Saleable area and the floor areas of every balcony, utility platform and verandah (if any) to the extent that it forms part of the residential property are calculated in accordance with section 8 of the Residential Properties (First-hand Sales) Ordinance. For details of saleable area and areas of other specified items (not included in saleable area), please refer to the sales brochure. There are architectural features, metal grilles and/or exposed pipes on the external walls of some of the floors. For details, please refer to the latest approved building plans. Common pipes exposed and/or enclosed in cladding are located at/adjacent to the balcony and/or flat roof and/or air-conditioner platform and/or external wall of some residential units. For details, please refer to the latest approved building plans and/or approved drainage plans. There are sunken slabs (for mechanical & electrical services of units above) and/or ceiling bulkheads for the air-conditioning fittings and/or mechanical & electrical services at some residential units. There are exposed pipes installed in some stores and toilets. Balconies and utility platforms are non-enclosed areas. Symbols of fittings and fitments such as bath tub, sink, water closet, shower, sink counter, etc. shown at the floor plan are prepared based on the latest approved building plans and are for general indication only. The floor plan has been simplified and is for reference only, and the vendor reserves the right to modify the building plans. Subject to the final approved building plans. For sizes and dimensions of the residential properties, please refer to the sales brochure for details. There may be architectural features and/or exposed pipes on external walls of some floors. Common pipes exposed and/ or enclosed in cladding are located at/ adjacent to balcony and/ or flat roof and/ or utility platform and/or air-conditioner platform and/ or external wall of some units. There are ceiling bulkheads or false ceiling at living room, dining room, bedrooms, lay., store, kitchen of some units for the air-conditioning system and/ or mechanical and electrical services. There are sunken slabs for mechanical & electrical services of units above at some residential units. The internal ceiling height within some units may vary due to structural, architectural and/ or decoration design variations. Symbols of fittings and fitments shown on the floor plans, such as bathtubs, sink, water closets, sink counter, etc, are retrieved from the latest approved building plans and are for general indication only. There are exposed pipes mounted at part of flat roof and roof of each tower in the Phase. Only part of the exposed pipes are covered by aluminium cladding. For some residential units, the air-conditioner platform(s) outside the residential unit will be placed with outdoor air-conditioner unit(s) belonging to its unit and/ or other units. The placement of these air-conditioner unit(s) may have heat and/ or sounds. Balconies and utility platforms are non-enclosed area. During the necessary maintenance of the external walls by manager of the Phase, the gondola will be operating in the airspace outside window of residential properties and above flat roof/ roof in such tower. There are non-structural prefabricated external walls in the residential units. The Saleable Area as defined in the Formal Agreement for Sale and Purchase of a residential unit has included the non-structural prefabricated external walls and is measured from the exterior of such non-structural prefabricated external walls. Saleable Area: 576 Sq. Ft.
10. There are non-structural prefabricated external walls in the residential units. The Saleable Area as defined in the Formal Agreement for Sale and Purchase of a residential unit has included the non-structural prefabricated external walls and is measured from the exterior of such non-structural prefabricated external walls. Saleable Area: 800 Sq. Ft.
Saleable Area: 1087 Sq. Ft.
Saleable Area: 1344 Sq. Ft. This photograph is not taken at or from the Phase of the Development. Information was extracted from the website of Hong Kong's government news << devoted to promote the development of football >> on 18 December 2017 (http://www.news.gov.hk/tc/record/html/2017/10/20171014_173741.lin.shtml).The Football Training Centre is under construction, the details of the said centre, including but not limited to the usage, location, design and completion time etc. will be subject to the final decision of the government. The construction of the Football Training Centre may not yet be completed upon the completion of the Phase of the Development and the details upon completion of the said centre may also differ from those described in this advertisement/promotion material. All of the above shall not constitute or be construed as constituting any offer, undertaking, representation or warranty whether express or implied. Information was extracted from the << Tseung Kwan O Area 77 Water Sports Centre Development Area >> of Sai Kung District Council on December 18, 2017 (http://www.districtcouncils.gov.hk/archive/sk_d/pdf/dfmc/2011/SK_dfmc_2011_032_TC.pdf). The design, use and area of the water sports centre will be subject to the final plan approved by the government. All of the above shall not constitute or be construed as constituting any offer, undertaking, representation or warranty whether express or implied. Information was extracted from the website of Cycling Information Centre on December 18, 2017 (http://www.td.gov.hk/mini_site/cic/files/map_pdf/Tseung_Kwan_O_tc_170412.pdf). The shopping mall is under construction, the above is for reference only. The design, size and actual facilities of the shopping mall will be subject to the final approval plan approved by the relevant government authorities, and may not be available for use when the Phase of the Development is completed. The shopping mall under construction is located on development site C1 and not within the Phase of the Development. The vendor, as owner, reserves the right to make decisions and/or change the opening and/or opening dates of the shopping mall and any of its facilities. Information was extracted from the website of <<Tseung Kwan O - Lam Tin Tunnel>> (http://www.tko-ltt.hk/) and the website of << Cross Bay Link, Tseung Kwan O>> (http://www.cbltko.hk/) on 18 December 2017. The proposed roads, buildings and facilities in this advertisement/promotion material are for reference only, their details (including but not limited to implementation, location, design, route, completion and transit time, etc.) shall be subject to the final decision of the government. The said construction may not yet be completed upon the completion of the Phase of the Development and the details upon completion of the said construction may also differ from those described in this advertisement/promotion material. All of the above shall not constitute or be construed as constituting any offer, undertaking, representation or warranty whether express or implied. Information was extracted from the approved Master Layout Plan on 6 February 2015. Information was extracted from the school website of << Shrewsbury International School >> (http://www.shrewsbury.hk/Welcome-to-Admissions) on 18 December 2017. The school building is under construction and opening school date is expected to be in 2018/19. School use and opening hours are subject to the government's final approval. All of the above shall not constitute or be construed as constituting any offer, undertaking, representation or warranty whether express or implied. Information was extracted from the website of The Leisure and Cultural Services Department << Controlling Officer’s Reply of the 2014-15 Expenditure >> (http://www.lcsd.gov.hk/b5/doc/HAB460_c.pdf). The design, use and area of Wan Po Road Pet Garden will be subject to the final plan approved by the government. All of the above shall not constitute or be construed as constituting any offer, undertaking, representation or warranty whether express or implied. Information was extracted from the website of Sai Kung District Council << The scope of development of the district open spaces at Areas 66 and 68 of Tseung Kwan O (revised proposal) >> (http://www.districtcouncils.gov.hk/sk/doc/2016_2019/tc/committee_meetings_doc/dfmc/12352/SK_DFMC_2017_091_TC.pdf). The design, use and area of Central Avenue will be subject to the final plan approved by the government. All of the above shall not constitute or be construed as constituting any offer, undertaking, representation or warranty whether express or implied. Information was extracted from the school website of << French International School >> (https://www.fis.edu.hk/en/tseung-kwan-o) on 18 December 2017. The school building is under construction and opening school date is expected to be in 2018/19. School use and opening hours are subject to the government's final approval. All of the above shall not constitute or be construed as constituting any offer, undertaking, representation or warranty whether express or implied. Information was extracted from the website of Sai Kung District Council << Consultation Paper of Construction of New Government Buildings in Area 67 >> (http://www.districtcouncils.gov.hk/sk/doc/2016_2019/tc/dc_meetings_doc/12259/SK_2017_001_TC.pdf). The design, use and area of Joint User Building and Immigration Headquarters will be subject to the final plan approved by the government. All of the above shall not constitute or be construed as constituting any offer, undertaking, representation or warranty whether express or implied. *"O’South” series refers to the four developments known respectively as “The Parkside”, “CAPRI”, “SAVANNAH” and “MONTEREY”. “The Parkside”, “CAPRI”, “SAVANNAH” and “MONTEREY” are four independent developments, each of which is governed by a separate set of land grant documents and terms and conditions of agreements for sale and purchase and are not relevant to the Development or the Phase of the Development. 1. The website of <<Overview of Route 6>> (http://www.trunkroadt2.gov.hk/tc/overview.html) on 13 February 2018. 2. The website of <<Tseung Kwan O – Lam Tin Tunnel>> (http://www.tko-ltt.hk/en/about_background.php) on 18 December 2017. 3. 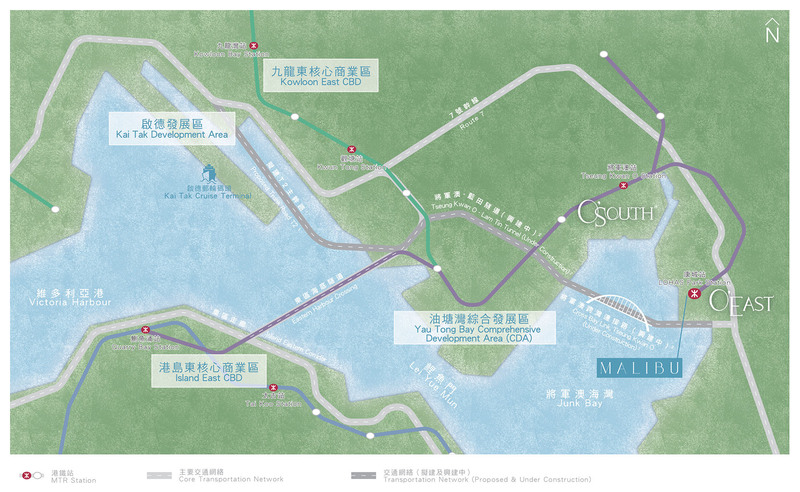 <<Tseung Kwan O – Lam Tin Tunnel & Cross Bay Link Proposed Scheme>> of Civil Engineering and Development Department (http://www.cbltko.hk/en/about_background.php/) on 18 December 2017. The information are for reference only, and is subject to actual traffic and road conditions. All of the above shall not constitute or be construed as constituting any offer, undertaking, representation or warranty whether express or implied. Source of the map: <<GeoInfo Map>> of Lands Department ( http://www1.map.gov.hk/gih3/view/index.jsp). The drawings of the above transportation network are simplified, have been edited with computerized imaging techniques and not to scale. They are for reference only and the railway routes may change from time to time. The drawings shall not constitute or be construed as constituting any offer, undertaking, representation or warranty whether express or implied. The buildings and/or facilities mentioned on this page are not directly next to the Phase of the Development and do not form part of the Phase of the Development. They may not be necessarily within the sight of the Phase of the Development. The Vendor advises prospective buyers to conduct an on-site visit to gain a better understanding of the Phase of the Development, the surrounding environment and the public facilities nearby. The roads, buildings and facilities being proposed or under construction in this advertisement/promotion material are for reference only, details of which (including but not limited to implementation, location, design, route, completion and transit time, etc.) will be subject to the final decision of the government. The construction of the same may not yet be completed upon the completion of the Phase of the Development and the details upon completion of the same may also differ from those described in this advertisement/promotion material. All of the above shall not constitute or be construed as constituting any offer, undertaking, representation or warranty whether express or implied. In this very place a fresh new lifestyle will rise, ushering in a new concept in natural waterside urban living. The eastern sun gives warmth and hope— wherever the sun rises, that’s where living begins. Sunlit and vibrant, O’East is a completely new waterfront community replicating the sought-after lifestyle epitomized by O’South*, offering 21st- century urban connectivity in beautiful natural surroundings. With fresh air, fast connections, waterside lifestyle, a lively city rhythm, surrounded by lush greenery – it’s a magical array combining the best of dynamic metropolitan life with lasting moments of tranquility. *"O’South” series refers to the four developments known respectively as “The Parkside”, “CAPRI”, “SAVANNAH” and “MONTEREY”. “The Parkside”, “CAPRI”, “SAVANNAH” and “MONTEREY” are four independent developments, each of which is governed by a separate set of land grant documents and terms and conditions of agreements for sale and purchase and are not relevant to the Development or the Phase of the Development. The names of the clubhouse's areas and facilities are for promotional purpose only and shall not be displayed in any deed of mutual covenants, provisional sale and purchase agreements, formal sale and purchase agreements, assignments or other title deeds. The rendering shown herein have been edited with computerized imaging techniques and is for reference only. The Phase of the Development is under construction. The vendor reserves the right to change the Phase of the Development and its clubhouse as shown in this rendering, including but not limited to changing the building plans, clubhouse and recreational facilities and fittings, finishes and appliances of the Phase of the Development. The information in this advertisement is not indicative of the final appearance of the clubhouse and recreational facilities for the Phase of the Development upon completion and is for reference only. It does not constitute or shall not be construed as a reference to any actual design, layout, space, building, position, fittings, finishes, appliances, furniture, decorative materials, plants, landscaping and other objects of the clubhouse and recreational facilities, or their vicinities, facilities or buildings, whether express or implied, as an offer, undertaking, representation or warranty. The colors, materials, fittings, finishes, appliances, decorations, plants, landscaping and other objects of the clubhouse and gardens are not standard provisions and may not necessarily be provided or appear in the Phase of the Development or any part thereof upon completion. The vendor reserves the right to make modifications and changes to the clubhouse facilities and the gardens and any part thereof without notice to purchasers. Purchasers shall not rely on this advertisement for any purposes. Purchasers are advised to refer to the sales brochure for any information on the Phase of the Development. The facilities and completion date of the clubhouse, gardens and/or recreational facilities will be subject to the final approval of Buildings Department, Lands Department and/or other relevant government departments. Clubhouse, gardens and/or recreational facilities in the Phase of the Development may not be immediately available for use upon the delivery of vacant possession of the units. The use or operation of some facilities and/or services may be subject to the clubhouse rules and the consent or permit issued by relevant government department. Clubhouse and/or recreational facilities may be subject to charges. All of the above shall not constitute and shall not be considered to constitute any offer, undertaking, representation or warranty whatsoever, whether express or implied (whether relating to view or not). The rendering has been edited and processed with computerized imaging techniques and is for reference only. The Phase of the Development is under construction. The rendering only represents an artist's impression of the general appearance of the Phase of the Development or any part thereof only, and is not for showing the actual view, appearance, finished appearance and surrounding environment of the Phase of the Development upon completion. The facilities, fittings, finishes, appliances, decorative items, lightings, furniture, plants, landscaping and other objects shown in the rendering may not necessarily be provided or appear in the Phase of the Development or its vicinity upon completion. The colors, materials, fixtures, fittings, finishes, appliances, decorations, plants, landscaping and other objects shown in the rendering are not standard provisions and may not necessarily be provided or appear in the Phase of the Development or any part thereof upon completion. Pipes, conduits, air-conditioning units, grilles, etc. and other facilities which may exist on the external walls, flat roof and roof of the Phase of the Development have been omitted. Surrounding buildings or environment of the Phase of the Development may also have been omitted. The vendor also advises prospective purchasers to conduct an on-site visit for a better understanding of the Development, its surrounding environment and the public facilities nearby. The vendor reserves the right to modify the Phase of the Development project and any part thereof in accordance with the latest approved plans of the relevant government departments. All of the above shall not constitute or be construed as constituting any offer, undertaking, representation or warranty whether express or implied (whether relating to view or not). This photo was taken on 8th May, 2018 at the modified show flat. The photograph(s) is/are for reference only and the colour thereof has been edited and processed with computerized imaging techniques. The Vendor reserves the right to change the fittings and finishes and appliances, the building plans and other plans of the Phase of the Development. The provision of fittings, finishes and appliances is subject to the terms in the Agreement for Sale and Purchase. The aforesaid design, fittings, finishes and appliances may not be applicable to each part of the unit. The aforesaid design, fittings, finishes and appliances may not be provided to each unit. Please refer to the sales brochure for the area, dimensions and layout of the unit. The videos, stock photos, photos and drawings shown in this website are not taken at or from the Phase of the Development and is not produced according to the Phase of the Development. They do not represent the actual appearance, view or surrounding environment of the Phase of the Development when completed. These videos, stock photos, photos and drawings have been edited and processed with computerized imaging techniques and are for reference only. They do not constitute and shall not be considered to constitute any offer, undertaking, representation or warranty whatsoever, whether express or implied, on the part of the Vendor regarding the Phase of the Development or any part thereof (whether related to view or not). The naming “O’East” is for promotional purpose only, and will not appear in the assignment, building plans or other title or legal documents.